Peter Young has been an avid fisherman since the age of three. His passion for the craft of fishing eventually led him to Port Aransas where he has worked as an offshore boat captain for over ten years. His interest in learning more about the fish themselves led him to obtain a Master’s degree in Fisheries and Mariculture from Texas A&M University-Corpus Christi. Some of his career highlights include leading a citizen-scientist based, community involved age and growth study of dolphinfish and captaining the first place boat in the Poco Bueno tournament of 2012. 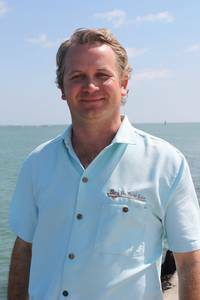 Peter’s constant pursuit of knowledge and general passion for the sportfishing industry led him to become a boat broker; his contacts in the industry, unrelenting work ethic, and tenacious aptitude help to make him the ideal broker for your next buying or selling experience. Peter prides himself on putting the interests of his clients above all. 110 S Fulton Beach Rd.